Where appropriate, mathematics is integrated into the transdisciplinary units of inquiry. This is particularly true of the data handling, measurement, shape and space, and pattern and function strands. Emphasis is placed on the explicit teaching of numeracy in relation to both number knowledge and strategy. A number framework is used to track student progress in numeracy and inform teaching practice. The framework enables teachers to know their students accurately, and to develop numeracy through detailed assessment and explicit identification of key developmental milestones. It stresses differentiated learning and the development of both knowledge and strategy across addition and subtraction, multiplication and division, and ratio and proportion domains. Students are encouraged to engage in mathematical discourse through the sharing of their solutions, proving the validity of their answers and engaging in discussions with teachers and peers, which allow them to construct new learning. 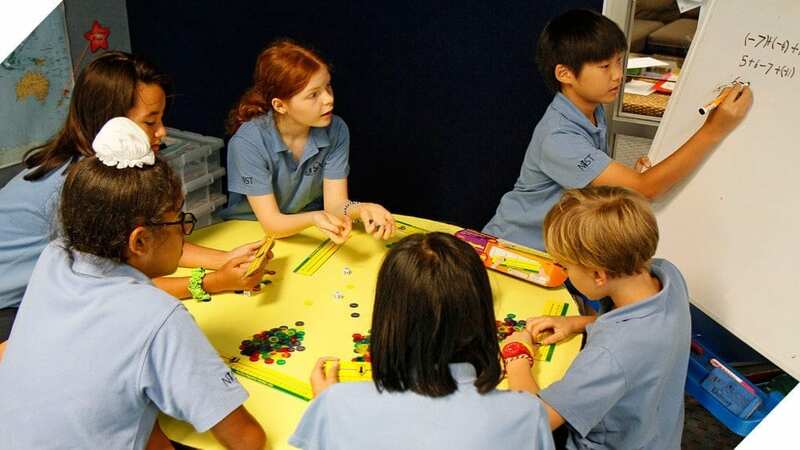 Typically students work in small groups during math sessions on experiences, which are targeted at their stage of knowledge or strategy development. The MYP mathematics programme is tailored to the needs of students, seeking to intrigue and motivate them to learn its principles by providing authentic examples of how mathematics is useful and relevant to their lives. Students in the MYP are encouraged to use ICT tools to represent information, explore and model situations, and find solutions to various problems. These are skills that are useful in a wide range of arenas. MYP mathematics aims to equip all students with the knowledge, understanding and intellectual capabilities to address further courses in mathematics, as well as prepare those students who will use mathematics in their studies, workplaces and lives in general. The emphasis on understanding increases as students work towards developing a strong mathematical knowledge base that will allow them to study a wide range of topics. Through this process they also work on communicating their ideas in ways that allow others to understand their thinking. Students in Year 9 are placed after careful assessment into either MYP standard or extended mathematics. The knowledge, skills and attitudes that students develop in mathematics courses provide a meaningful foundation for further study and help to prepare students for careers in fields such a climate research, actuary and insurance work, public-policy development, engineering, financial analysis and economic development, research and analysis, software development, biostatistics and epidemiology, law, and medicine. The diploma mathematics programme offers three courses: mathematical studies standard level (SL), mathematics SL and mathematics higher level (HL). MYP students enrolled in extended mathematics generally elect to take HL mathematics courses in the Diploma Programme.